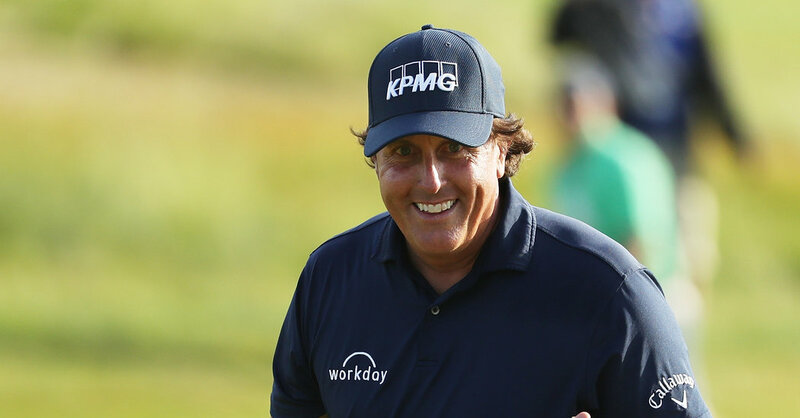 SOUTHAMPTON, N.Y. — At the stroke of midnight, Phil Mickelson would turn 48. But there he was on Friday, with the Shinnecock Hills practice green all to himself, searching in the gloaming for the one missing piece in his Hall of Fame career. In the second round of his 27th United States Open, Mickelson chased his opening 77 with a one-under-par 69 to keep alive his dream of completing a career Grand Slam. “I played a lot better today,” said Mickelson, who finished the day 10 strokes behind the leader, Dustin Johnson. After making bogeys on two of the first three holes, Mickelson was nine over for the tournament and in danger of missing the cut. But he covered the final 15 holes in three under and advanced to the weekend at six over, with two strokes to spare. With his post-round practice, Mickelson addressed the other half of the battle. Despite making obvious progress, Mickelson still wasn’t satisfied with his performance on or around the greens, which is usually his strength. So after signing his scorecard, signing autographs for fans and speaking with the news media, Mickelson spent 20 minutes rolling putts and hitting chips in front of his swing coach, Andrew Getson. Mickelson began the week as one of five players in the field who had competed in the 1995 United States Open here. After Friday, he and Steve Stricker (eight over) were the last men standing from that group, which also included Tiger Woods (10 over), Ernie Els (17 over) and Kenny Perry (18 over). Mickelson finished in a six-way tie for fourth in 1995, four strokes behind the winner, Corey Pavin. One of the players who equaled Mickelson’s four-over score was Neal Lancaster, who stood at eight over after 63 holes, then closed in six under to post the first sub-30 score for nine holes in the event’s history. Mickelson is old enough to remember such milestones and young-at-heart enough to believe he can repeat them. Nobody knows how quickly one’s fortunes can change at the Open better than Mickelson, who has a record six runner-up finishes. Three of those have come on courses on Long Island, where the fans adore him as if he were one of their own. Mickelson thanked her, then fielded the next question.